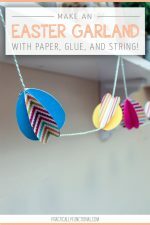 Home > Projects > Crafts > How To Make A Sewn Paper Garland! Paper garlands are a quick and easy way to decorate for any holiday, event, or party! 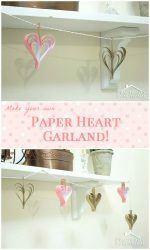 They’re easy to make and don’t require a lot of supplies, plus you can customize them in any shapes or colors you want! Today I’ll show you how to make a sewn paper garland in just a few steps! 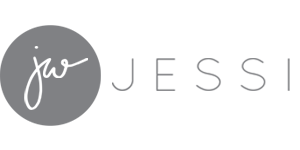 scissors, a paper punch, an X-acto knife, a Silhouette Cameo…anything that can cut paper! Start by cutting out shapes from your paper. I chose shamrocks because it’s almost St. Patrick’s Day, but you can do anything you want! Cut out balloons or party hats for a birthday party, cut out hearts for Valentine’s Day, cut out egg shapes or bunnies for Easter, cut out Christmas tree for Christmas…you get the idea! Once your paper shapes are cut out, all you have to do is sew them into a garland! 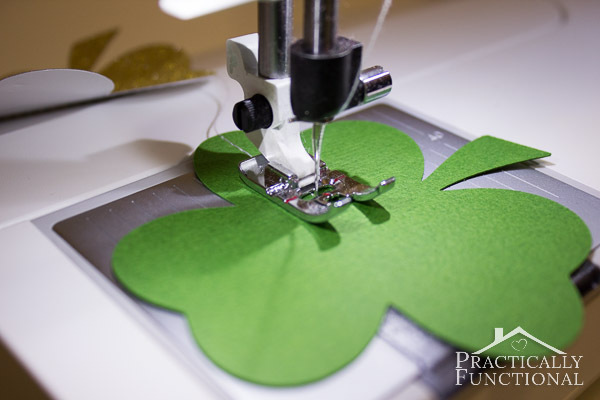 Pull out about six inches of thread and leave it as a tail, then slowly sew across the middle of one paper shape. Or sew closer to the top if you want to make sure your shapes hang upright; if you sew through the middle they may flip upside down every once in a while. 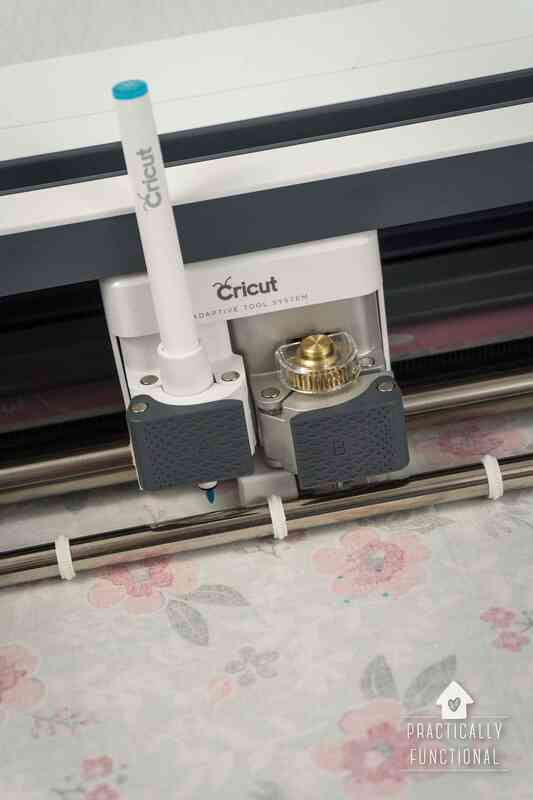 Paper is thinner than fabric, so make sure the tension on your machine is set pretty low, and set the stitch length to something pretty long, so you don’t have too many holes all in a row. (Otherwise your paper may tear.) Just go slow and you’ll be fine! When you get to the end of the first paper shape, just keep sewing; don’t lift the foot or cut the thread. 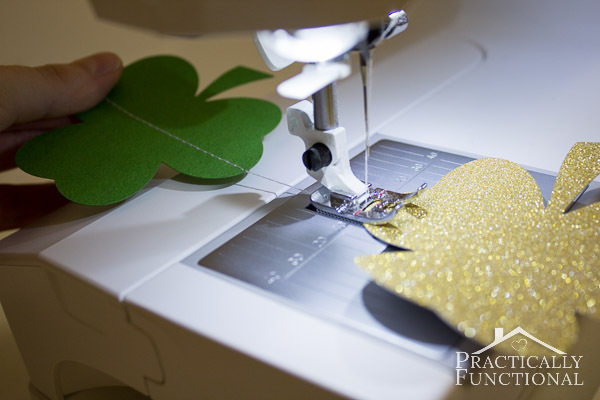 Gently pull the shape out behind the sewing machine and keep sewing so that you get about one to two inches of “sewn thread” before you start sewing onto the next shape. 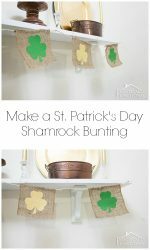 Keep sewing across one shape at a time, and then “sewing nothing” for an inch or two, until you have sewn all of your shapes into a long garland. Lift up the foot and cut the thread, leaving another six inch tail on this end. And now you have an adorable sewn paper garland! Hang it on a mantel, off a table, over a doorway, or wherever, and enjoy! Looking for other paper craft projects? Check out these awesome ideas! Great minds think alike! I also did some garland…tiny garland. 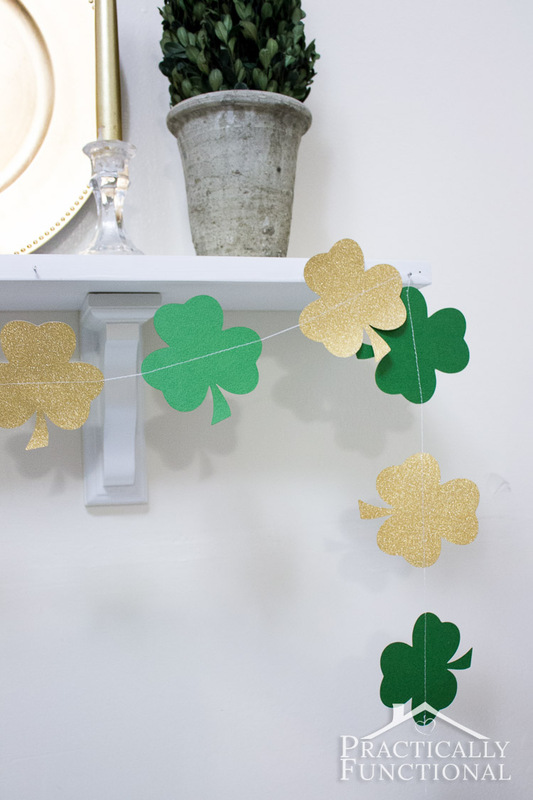 I’m LOVING this shamrock garland though…so cute! Adorable! I might have to try this for Easter! I didn’t know you could sew paper, this is so cute. Thanks for sharing. 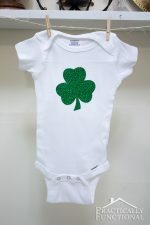 I love the sparkly clovers! I have been meaning to try making a garland like this… another one on my to do list! Very cute! 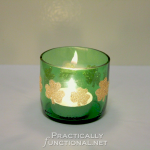 I love the gold shamrocks. Thanks for your tips on sewing paper. I’ve been a little scared to try it with my machine. Very pretty! I’m dusting off my sewing machine!! I’ve been wanting to use it with a project. Thanks for the inspiration!! This garland is very neat! I love the bling that the glitter paper adds to it. So pretty! I’ve made a lot of paper banners but have yet to sew one together, thanks for the inspiration! One day, I want to learn to sew so that I can do fun stuff like this! You did a great job on it! Your garland looks fabulous! I never think to use my sewing machine for paper crafting, such a great idea! I’m so excited to be a part of this incredibly talented Silhouette Challenge group! So cute, Jessi! I love it! I wish I could sew…like seriously, not even buttons…..and this is adorable! 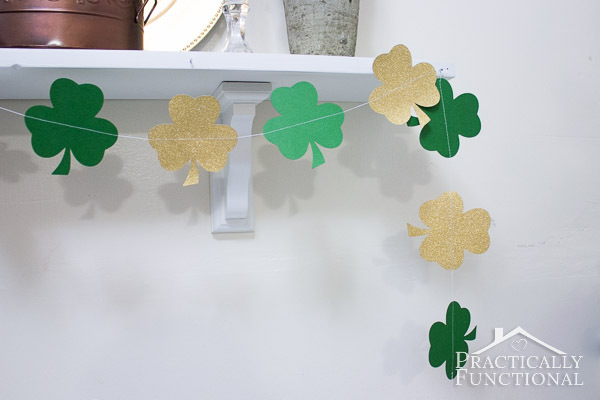 I love your simple garland to bring a little Irish green into your home. I have been dying to try this technique of sewing paper! Greas project!